As you can see, quotes from Bach are used to illustrate the point. If true, this would make playing the piece I'm having trouble with (Goldberg Variation #29) much easier, but I was surprised. Is this accurate? How do most performers of Bach play such rhythms? Most of the pieces I'm interested in are fast so I can't really tell when listening to Gould or Hantai. It appears that there is not consensus on how these polyrhythms should be played. I have not yet found anything on your (a) case, but have some information about your (b) case. The quotes are long, but I think seeing the author's reasoning is helpful. Johann Quantz, in his treatise On Playing the Flute, late 1700s, holds that dotted rhythms are non-literal and that the note following a dotted note with a flag (eighth, sixteenth, thirty-second) is always very short, literally a 128th note, regardless of tempo. In dotted quavers, semiquavers, and demisemiquavers...you must depart from the general rule, because of the animation that these notes must express. It is particularly important to observe that the notes after the dots in (c) and (d) [c: dotted 8ths and 16ths, d: dotted 16ths and 32nds] must be played just as short as those [after the dots][sic] in e [dotted 32nds and 64ths], whether the tempo is slow or fast. 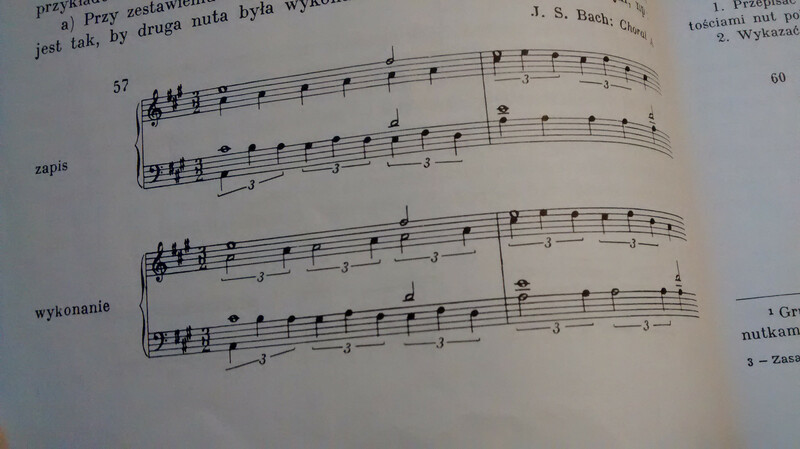 [He later gives the examples again with doubly and triply dotted notes followed by 64th and 128th notes]. He goes on to describe these "inflated dots" as livelier, bolder, flattering, and pleasing. In a section otherwise written for beginners about the basics of decoding sheet music, he spends a lot of time on ensuring that we know exactly what he wants done with dots. It also stands out as polyrhythm is not really a large concern for beginning baroque flute players. C. P. E. Bach, in Versuch über die wahre Art das Clavier zu spielen, 1762, came down on the other side of this question, and spills much less ink. My French is rusty, my German non-existent, and Google Translate decidedly mediocre on technical music stuff, so if anyone has access to the English translation, feel free to edit/correct. What follows is from "Interpretation, §27." Because of the frequent use of triplets in "incorrect" measures, for example, 4/4, also in 2/4 or 3/4, there are numerous bits that could be notated more easily with quavers grouped in 6, 9, or 12 in places. In this type of measure, the notes are [cannot be notated as triplets, and must] then divided as we see in this figure because of the other part. [What follows are examples like your (b) case]. In other words, play the 16th and the end of the triplet together. Personally I play a lot of Baroque music and I almost always match the triplet, as you indicated above. Ever Baroque musician I've worked with does the same, with very few exceptions. I have heard some arguments over the gigue in Bach's 6th partita, but generally I hear that performed as though it's all written in triplets. My experience of baroque music is that even though we think of it as uptight, it had a more fluid sense of rhythm than we give it credit for. So, no citations and I would definitely upvote an answer with more citations than I, but wanted to offer my personal experience. Here there is a double time signature, "cut time" (Alla breve) followed by 12/8, and the opening bars are (apparently) alternately in 12/8 and cut time - though there is an unanswered question as to why the time signature puts the cut time first, but the music starts with the 12/8 rhythm. After the double-bar, the "12/8" and "Alla breve" motifs are combined in counterpoint. But as Tovey said in the notes on his edition, if the combined passages were meant to be played as in the OP's reference, it seems incomprehensible that either (a) if the whole piece is meant to be in 12/8, why did Bach go to so much trouble in the first few bars to write one simple rhythm incorrectly in terms of a different one? or (b) If the opening is in cut time but the later passages are not, why does the "cut time" motif inexplicably change its rhythm when it is combined with something else? (Note: that is my paraphrase of Tovey's comment, not an exact quote - I don't have his score available right now). With "two beats in the bar", the prelude makes good musical sense played exactly as written. A possible explanation might be that this elaborate notation was really an exercise for a pupil about reading French-style "notes inégales". Personally I'm not very convinced by that - Bach's "notes inégales" movements tend to be written in dotted-8th plus 16th-notes (e.g. Contrapunctus II of the Art of Fugue). I don't think there is any debate that if a triplet is written against a dotted-8th plus 16th, as in the OP's second example, the meaning is that the 16th-note is either 1/3 or 1/6 of a quarter note, depending on the tempo (i.e. it is not a mathematically exact 16th-note). Dotted rhythms were always open to interpretation as to the exact length of the dotted notes. Bach wrote the triplets "incorrectly" as 8th-notes, not quarter-notes. 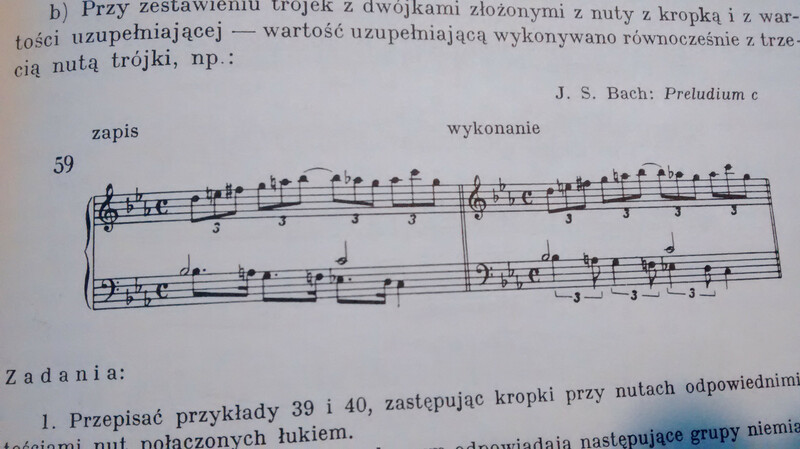 On the middle system of the second page, he writes a few "quarter + eighth" triplets explicitly as such. If you want to interpret all the duplets as triplets, this raises the same question as with BWV 874: why did Bach write two different notations for the same rhythm? The form and instrumentation of the piece seems relevant here. It is a chorale prelude in 4 parts, for organ. The tenor part is marked "Ped", meaning it is to be played on the organ pedals. The autograph writes the tenor at the sounding pitch of the notes. But that is only half the story, because the piece is acutally a double canon. The chorale melody appears as a canon in the octave between treble and tenor, and the alto and bass are another canon at the octave. Both canons continue till the final few bars. It follows from that (and the argument is supported by the frequent collisions between the long notes in the treble and short notes in the alto) that both the treble and tenor were meant to be played on the organ pedals using a stop that sounds an octave higher than the standard (8 foot) pitch. Thus, there are four independent parts, each played separately by one hand or one foot. In the final few bars, the treble and alto parts cross over, otherwise the top part goes too high for the organ pedals. The organist's feet are then playing the two inner parts of the four part counterpoint. If this (lively and exuberant) piece were performed by four soloists (e.g. two trumpets and two trombones) the most natural way to approach it would be with an even (and fairly quick-paced) 3-in-a-bar beat, and to let the subdivisions of the shorter notes fall where they may. If the individual players want to improvise a bit, well, let them do that! An organist (with enough technical skill) can do the same playing all four parts at the same time, just as a jazz drummer can play four independent rhythms at once while maintaining a regular "beat". But if you start to study the score from the point of view of a pianist (and there is no particular problem playing "all the notes exactly as written" on a piano) it may not be obvious what was originally intended. Not the answer you're looking for? Browse other questions tagged j-s-bach polyrhythm tuplet or ask your own question.